Keen Koala: How To Clean The Flame Sensor On A Lennox Furnace. How To Clean The Flame Sensor On A Lennox Furnace. Today we came home and our furnace wasn't working. Luckily it wasn't too cold outside. The first thing I did was turn off the thermostat, waited a few seconds and then turned it on again. The furnace began to work. I watched through the furnace door as the element began to glow red and then the gas came on and it glowed with blue flames, but then it stopped and it wouldn't go back on. I suspected this could be because the flame sensor was dirty. Before you proceed, if you are not comfortable with this type of DIY project, I would highly recommend calling a professional. 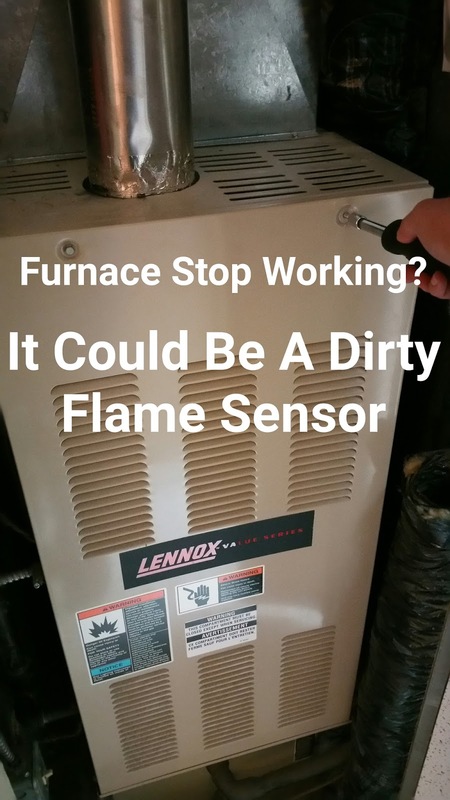 I should also mention that I'm not a furnace expert, I'm just handy, and cleaning a flame sensor is fairly simple. Disclosure: This post contains affiliate links. I earn a small commission from Amazon.ca when someone makes a purchase using my Amazon Associate links, which helps support my blogging activities. Thank you. You will need a socket set to complete this project. If you don't have a socket set, a pair of needle nose pliers may work in a pinch to remove the bolts. I highly recommend purchasing a general socket set though, it will pay for itself after the first use! You can check out this great basic socket set on Amazon for a great price by clicking HERE. 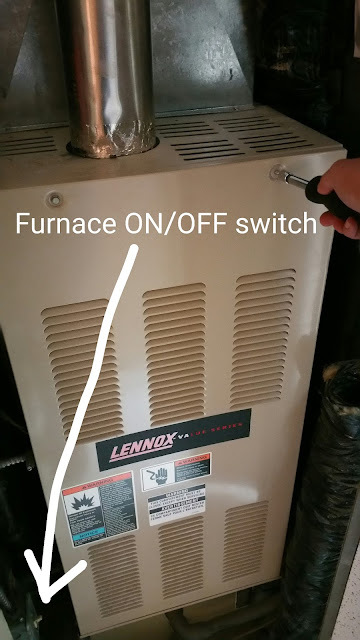 The first step is to locate the power switch right beside your furnace. Mine looks like a light switch, but it's white. Turn this switch off. Next, you will need to turn off the breaker in your house's breaker box that controls the furnace! Safety first. Next, you will need to take the door off of your furnace. Mine is just held on by 2 bolts at the top. Once the bolts are removed, lift the door up and away from the furnace. Now, it's time to locate the flame sensor. Look for a wire leading to either directly above or below the burners. Mine is this white wire located just below the burners. Unplug the wire from the flame sensor. To remove my flame sensor I had to use a socket wrench to remove 2 bolts that were holding it in place. 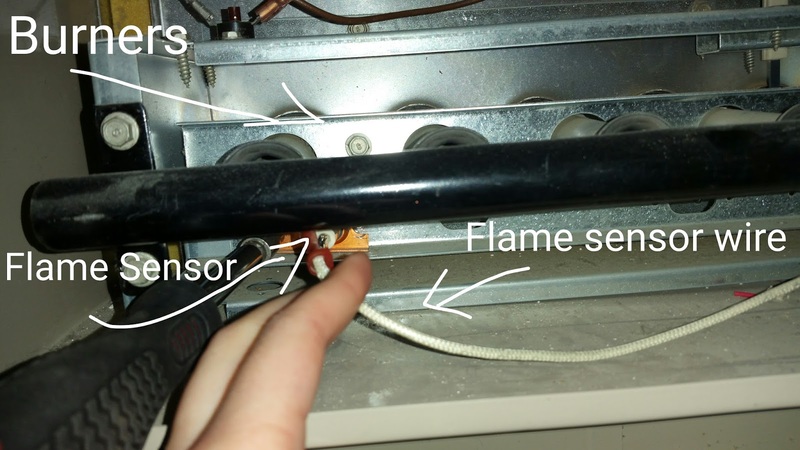 Carefully remove the flame sensor. Mine is L-shaped, so I had to do some fancy maneuvering to get it through the hole. Once you have removed the flame sensor,clean the metal L-shaped part very very very gently with a very low grit sand paper. The sand paper should be so soft that it feels smooth. If you use something too harsh it may damage your sensor. Don't touch the metal parts with your hands as the oils from your skin may damage it. Once you think it is clean, put it back in the same way that you took it out and replace the bolts. 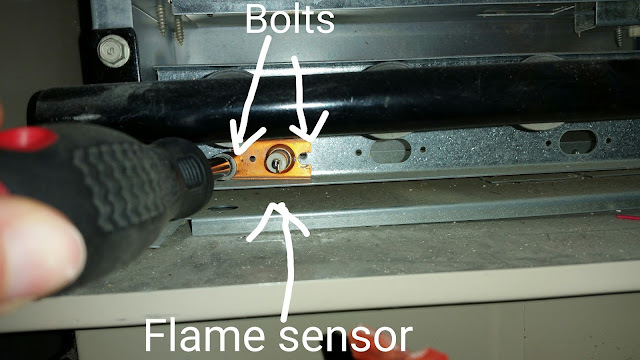 Reconnect the wire to the flame sensor. Replace the door on your furnace and put the bolts back in. Turn the breaker that controls your furnace back on and then turn the furnace switch back on. Make sure your thermostat is set to 'ON.' 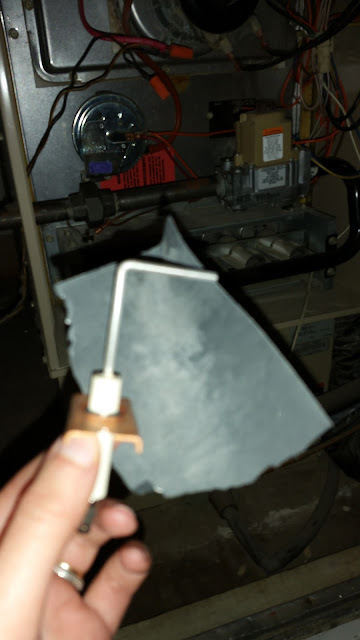 You should hear your furnace kick in right away! Problem solved. If your furnace still isn't working, please call a certified H-VAC specialist for a house-call. Did you enjoy this tutorial? Did it help you fix your furnace trouble? Let me know in the comments section below, I would love to hear from you. For more great tutorials and instant access to exclusive content and contests, 'LIKE' Keen Koala on Facebook by clicking HERE!